Over the years a few projects have come up which needed rules that had to be evaluated. One example is a shopping cart that could trigger a discount if a set of items was purchased. Another is a job seeker with a set of skills that could match a job posting. One more could be a user with a set of tags that prompted an advertisement to be displayed. To see if a user triggers a rule, we would start by collecting their attributes and then from each attribute traversing in and out the AND and OR nodes looking backwards and checking if we had (or didn’t have for NOTs) the attributes required. All relationships leading to the AND nodes would have be valid, but just one of the relationships leading to the OR nodes. This is a valid way of doing it, but today I’m going to show you an alternative. The magic happens in the findRules method. 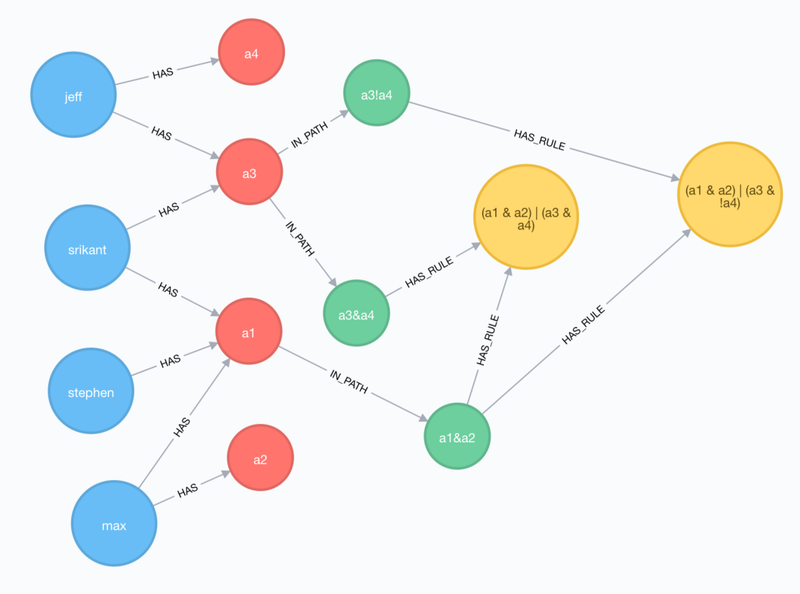 For each attribute node we traverse out the IN_PATH relationship and get the “path” property of the relationship. We split it into an array of strings each holding an attribute id. We also split the “path” property into a character array using just the ANDs (“&”) and NOTs (“!”). For each path we check to see if we are missing a needed attribute or if we have an attribute we should not have. If either one of those is true we fail the path we are on and try the next. // Split it up by attribute and by & and ! // Since our starting attribute is how we got here we skip checking it. This makes our logic pretty easy to follow and we don’t have to worry about chasing ANDs, ORs or NOTs depending on which nodes we land on along the way. But how do we build this graph in the first place you may ask? This next part is where the magic happens. We take our formula and create a Boolean Expression. In this boolean expression we are going to create a Truth Table and use the Quine McCluskey algorithm to find the prime implicants and Petrick’s Method to find all minimum sum-of-products solutions which become our “Path” nodes. Do you remember taking “Digital Logic” in college and thinking… I’m never going to use this stuff… yeah. Ok, now for each path we’ll check to see if another rule already created this path and if not we’ll make one. This will let us trigger many rules if they share a common path. We’ll be generous here and for each attribute in the path we will either find it or create it. We will connect our path node to the first attribute in the path. All of our paths will be sorted the same way, so we will never have two equivalent Path nodes. If we have an “a1 & a2”, we will never have an “a2 & a1” path. We will return both rules. I’ll spare you the details but the complete source code is on github as always…and now you know one way to build a rules engine in Neo4j. Update: If you have a path that is a single NOT or only NOTs it won’t work as shown. The way to deal with it is to have a global “always true” node in these cases and hang any single NOT or only NOT paths off this node that all users would have. This can be handled when the rule is being created or it handle during the path creation. Max, I don’t even know how to thank you. I’ve been recently assigned to a business rules engine project, and i was trying to make these work with Cypher [image: Imagini inline 1] I’ve been reading your articles for years, so, thank you! And keep posting!